Terrai Bath & Body care products are formulated using Coconut Oil and other natural ingredients that are beneficial for your skin and hair. The products are designed to provide the ultimate shower experience, pampering you with rich lather, pleasant fragrance and ultra moisturizing effect. Terrai Aloe Vera & Green Tea Shampoo is a rich luxurious shampoo made without harsh chemicals, animal ingredients or animal testing. Its mild and natural formula, containing Natural Aloe Vera Extract, penetrates the scalp to treat and rehydrate, while the product gently cleanses the scalp. Your hair is left gentle, full bodied and nourished, just as nature intended. 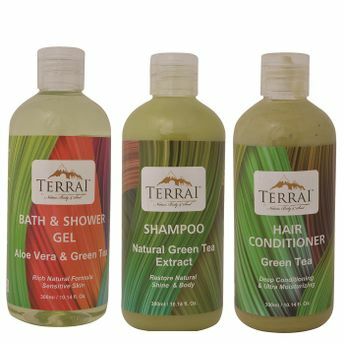 Terrai Hair Conditioners are formulated using latest generation of plant based ingredients and natural oils. 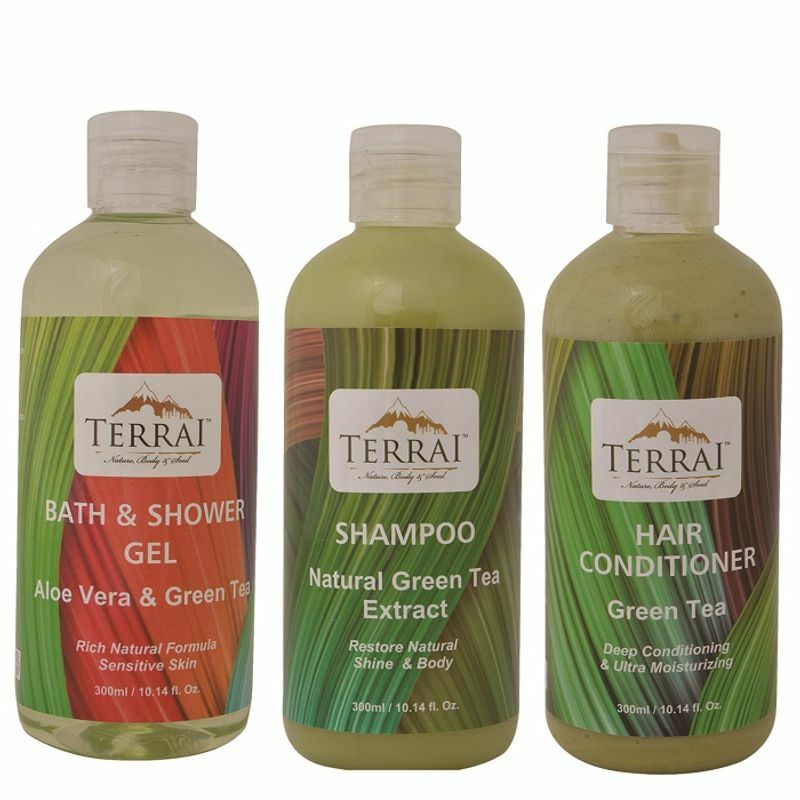 Terrai Green Tea Hair Conditioner contains Natural Aloe Vera Extract along with other natural ingredients that act to soothe the scalp and hydrate the hair naturally. Gentle enough for use on colored and treated hair and provides added protection against damage or breakage. Additional Information: Terrai is a leading signature brand, manufacturer and marketer of high-quality Skin & Hair care products. Established in 2010 by Mr. Dhruv Kumar, a Delhi based entrepreneur, Terrai Natural Products markets a range of quality skin & hair care products based on Ayurvedic formulations, specially designed to effectively cater to specific needs. An ISO 9001:2008 and GMP certified company, the brand believes in making the most natural products in environmentally friendly packaging, operating in an ever increasing sustainable manner & improving continuously in all aspects.